House hunting can be a daunting task because of not only the large number of properties to choose from but also biased and agenda-driven marketing by builders, agents and various online real estate portals. 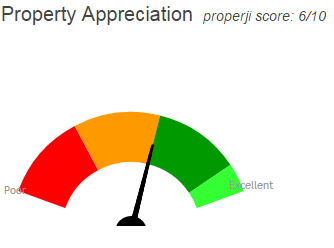 Properji brings relief and clarity to home buyers by providing unbiased and pro-buyer scores to compare the numerous options out there. Our objective and comprehensive evaluation considers multiple parameters to rank each and every project, builder and locality. These parameters are carefully thought through so that they are relevant to investors as well as end home-buyers – individuals, families and working professionals. Moreover, our diligent team periodically updates these scores so that new launches and developments in projects, localities or builders are instantly captured and reflected in the ranking. Get a quick glimpse into the selected project including Properji scores for property, builder and locality and basic facts such as total area, units, price, launch and possession dates, construction status etc. of the project. Additionally, ask queries and discuss the project with other Properji customers here. Get in depth analysis on the property’s pricing - compared with similar neighboring projects along critical dimensions, which influence price. The price comparison graph is easy to understand and helps instantly gauge the price appropriateness of the property while the summary bulleted points explain the same in detail. Know your money’s worth by understanding appreciation potential, market liquidity and rental potential of the property. View accurate to-date price movement in the property since pre-launch. See how much price appreciation our experts have predicted over the next three and five years. Understand the reason behind these past and expected price changes through the crisp summaries explaining each graph. Know a locality in-and-out within minutes through our locality score and concise yet insightfulanalysis. Get information on key infrastructure including transport, water, retail, offices, hospitals and educational institutes. See how fast inventory moves in the locality. View past price movement as well as expected price appreciation and understand what is driving these trends. Get key facts and detailed analysis from Properji experts on a builder’s strengths and weaknesses. View our builder score to assess the builder’s ability to successfully and timely deliver the project as promised without construction quality and legal issues and handle customers well. Make a well-informed purchase decision with complete knowledge of the property you want to invest in. Properji experts help you in the process by identifying in this section top risks in the project, builder and locality. Magicbricks Realty Services Limited (magicbricks.com), Times Centre (Digital Content Production Facility), FC - 6, (Third Floor), Sector 16 A, Film City, NOIDA - 201301, U.P. © 2012-2019 Magicbricks Realty Services Ltd. All Rights Reserved. * Disclaimer: Properji tries its best to ensure clients are provided fact-based research to make an informed decision. However, investment choices vary across investors subject to their specific needs. Hence, we recommend investor to not to solely rely upon this report. This report contains information available to the public and has been relied upon by Properji on the basis that it is accurate and complete. Properji accepts no responsibility if this should prove not to be the case. No warranty or representation, express or implied, is made to the accuracy or completeness of the information contained herein, and same is submitted subject to errors, omissions, change of price, rental or other conditions, withdrawal without notice, and to any special listing conditions imposed by our principals. Oops, we have a problem!